"You will become...an A-list superhero!" — Ralphie Hero [talking to herself in the mirror]. Gamer Girl is an ongoing superhero action comedy Web Serial Novel written by Joe Berridge Beale. It follows the bizarre adventures of Ralphie Hero, aka Gamer Girl, a superheroine with the superpower to summon the items and abilities of video game player characters. Working alongside her partner Comikazé Kazé Maniakku, aka Fangirl, a superhero fanatic with an electric fan gun, Ralphie sets out to make a name for herself in a city already full of crime fighters. Between the monsters, the supervillains, and Ralphies mild sociopathic tendencies, it does not go well. As of now, there is no update schedule, but finished chapters are always posted on a Sunday. Warning: Contains swearing, graphic violence, and British Humour. Character profiles, a terminology key, a trivia page, and other extra content can be found on the Gamer Girl WordPress site . Not to be confused with with the identically titled Gamer Girl (2008) young adult novel by Mari Mancusi. Animesque: Along with having a manga style cover, Gamer Girl is bursting with anime tropes, from manga-like facial expressions, to long, Shonen-esque fights, to wacky gag anime-style comedy. Bash Brothers: Ralphie and Kazé are best friends whose close quarters brawler and long range support fighting styles complement each other in battle. Canis Major: The Canine is an SUV-sized, pariah dog-like monster coated in fangs. Cultural Stereotypes: Most of the superhero and superfan characters in Gamer Girl adhere to the cultural stereotypes associated with their aliases. For example, Ralphie/Gamer Girl is a geeky, socially awkward teenager with an enthusiasm for violence and only one friend at school. Fangirl: Kazé is the self-proclaimed number one fan of the superhero Golden Boy as well as a superhero fangirl generally. Interestingly, her fandom seems to encompass both the real superheroes of the Gamer Girl Verse and fictional superheroes from Marvel and DC Comics. Kazé: Want to hear a joke to cheer you up? Kazé: What's Wonder Woman's favourite drug...? Ralphie: [after having been nudged] Whaaat? 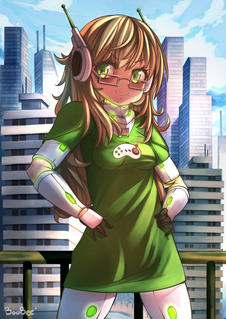 Gamer Chick: Ralphie frequently makes use of her in-depth video game knowledge to solve problems as a superhero, summoning everything from a Super Smash Bros. Falcon Punch to giant Tetris tetrominoes to a World of Warcraft Charger mount in order to defeat the Canine. Multiple Reference Pun: A staple of the serial. Kazé/Fangirl is a superhero fangirl who uses an electric fan gun, and the Canine is a literal canine covered in canine teeth. Ba dum tsss!